Together with landscape design, we accept landscape installation tasks for residential and commercial applications. We can create hardscapes such as driveways, patios, gazebos and the like aside from softscapes and water features (waterfalls, ponds, and more). Unlimited Landscape Hawaii LLC is known in Wahiawa and surrounding areas for its professional landscape installation service. Our seasoned landscapers are capable of creating awesome landscape settings for residential and commercial properties. Every landscape design plan that we create is highly personalized to ensure the complete satisfaction of our clients. Moreover, we carefully select each landscape element to achieve balance and harmony in the landscape. We make sure that all the landscape features and amenities will suit the overall theme of your home or property. Lastly, we consider your ideas, design recommendations, and budget when creating your dream landscape setting. Our crews will use proven installation methods and techniques to achieve your desired landscape setup. From selecting your chosen plantings to installing the different outdoor features and amenities, you are guaranteed of outstanding outcomes. Your plantings will be hand-picked from our partner nurseries to give you the best plant varieties. The other vital landscape elements, such as hardscapes, water and fire features, and outdoor living spaces, will be installed by well-experienced and properly trained crews. This means you will be getting well-built structures and amenities that can withstand extreme outdoor conditions. Our landscape installations are guaranteed long-lasting, functional, and appealing. Hire Unlimited Landscape Hawaii LLC today if you want professionally done landscape installations. 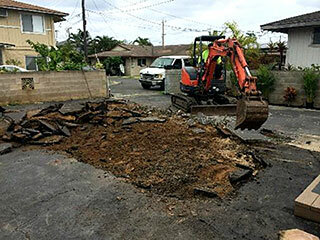 We can handle installation projects for residential and commercial clients across Oahu and nearby areas. You can also call us at (808) 726-9495 to learn more about our comprehensive landscape services.